Innerspring mattresses consist of interior metal coils designed to provide support for sleepers, distribute weight, and maintain the structure of the mattress over time. 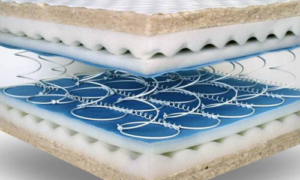 An innerspring mattress often includes a foam or pillow-top layer, and the coils themselves may come encased in pockets of foam or other material. Generally, this type of mattress will provide more bounce and greater temperature control/airflow than memory foam or latex mattresses. Of all the mattress types, innerspring is the most widely available for buyers to try out in retail stores, and therefore the most common. Although an innerspring mattress isn’t compressible and therefore portable, they are beginning to join the direct-to-customer scene with online retailers such as WinkBeds and Saatva cutting out the middlemen. Factors to consider when comparing innerspring mattresses are the coil count, the gauge of the metal used to make the springs, and the quality of the metal and other materials used. You’ll also want to consider the type and thickness of the comfort layer placed above the coil layer. 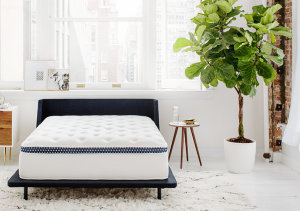 Options abound and can be difficult to compare, so here’s a quick guide to the main features of an innerspring mattress, our picks for the best innerspring mattresses, and their suitability for different sleep styles. Coil count: Just like it sounds, coil count is the number of coils in the mattress. The average coil count for a Queen innerspring mattress is 725. As the coil count goes up, so does the price, everything else being equal. Coil count alone, however, is not an accurate measure of quality or durability. The quality, strength, and type of coil will factor in as well, so don’t be fooled by claims of the highest numbers. Gauge: This measures the diameter of the metal wire used to make the coil. The gauge of most innerspring coils will range from 12-15, not including specialized mini-coils. A lower number correlates to a thicker wire and also to increased longevity. The heavier wire (lower gauge) creates a firmer comfort level. Expect the higher gauge coils to be soft with more give and take. Continuous: This is a common coil type, often present in low- to mid-priced mattresses. It refers to a mesh system of continuous wires running from head to foot in rows. Each row is attached to the one beside it, creating a single structure of wire. This arrangement is typical and yet not the most supportive. Noise and motion transfer are common complaints with this type. Offset: This type of coil arrangement is often found in mid- to high-priced mattresses. It rates higher in customer reviews for noise, motion isolation, and support than continuous coils. This type of coil has an hourglass–like shape, but with squared ends. They fit together in rows, and tend to be supportive and durable, offering more or less bounce depending on whether they are knotted (less) or open-ended (more). Bonnell/open: This type of coil has a similar shape to that of offset coils, but without the squared ends. They are generally less expensive and less durable. Bonnel or open coils tend to rate less satisfactory in the area of motion isolation. Pocket: Pocket coil construction will vary from one mattress to the next, but overall this design provides a good deal of support, fair motion isolation, and a firmer feel. Pocket coils are individually wrapped coils encased in a variety of materials including polyfoam. Research into customer reviews has shown that sagging and wear over time can be an issue with innerspring mattresses, and that, overall, those with a firmer comfort level and less padding/foam in the layers tend to last longer. Variety: Innerspring mattresses are available in every conceivable comfort level. With the variety of coil construction, as well as the addition of a vast array of comfort tops, the choices with this mattress type seem endless. While most latex mattresses, for instance, will have very similar characteristics, that’s not the case with innerspring. Affordability: The price range varies as much with this type of mattress as does the construction. For that reason, very affordable options are available. 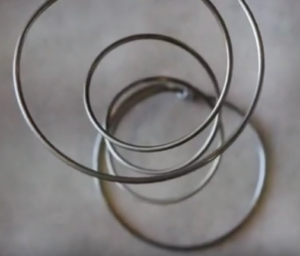 While thin gauge coils can lead to sagging, and the quality of material should always be considered, solid combinations of value and price can be found on the market. Bounce: The response time of an innerspring mattress makes maneuvering and position changes a piece of cake. What you sacrifice in body contouring and motion isolation, you gain in the springy give and take conducive to recreational activity. 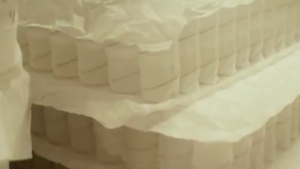 For sleepers who resist the “dead” feeling of foam, innerspring is the answer. 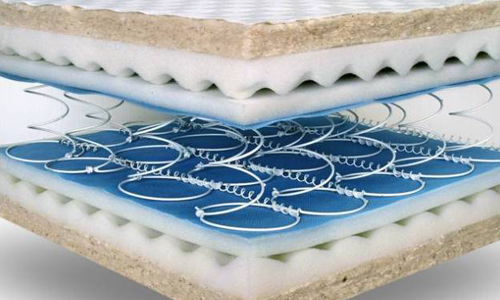 Offgassing: The materials used in coil mattresses generally produce less smell than that of foam mattresses. Although some contain foam layers and tops, customer reviewers consistently report little to no lingering odor. Temperature control: The coil construction of an innerspring allows for maximum airflow, transferring body heat away from sleepers rather than trapping it. Innerspring mattresses of every variety consistently rate higher in this area than memory foam. Noise: The creaking sound of metal springs can become a nuisance, and over time it seems almost inevitable with a coil mattress. Continuous coils carry the greatest risk of this problem. Motion transfer: Innerspring mattress construction has yet to match foam in this area. The higher-end models with combination layers of foam and spring come the closest. Durability: Sagging and eventual wear and tear are a common complaint over time with innerspring. The complex arrangement of the wires involved with coil combined with the open structure seem more susceptible to breakdown. What type of sleeper should consider an innerspring mattress? As previously mentioned, with recent advances in mattress design, there is likely a coil mattress for every type of sleeper. Both online and brick-and-mortar brands selling innerspring mattresses today usually have at least 3 comfort levels to choose from. Still, considering the presence of a steel-wire support structure, innerspring remains the firmest and most supportive option overall. Back sleepers need even support that will keep the spinal column in alignment for hours at a time. Innerspring mattresses tend to provide the support needed. Pay particular attention to the design of the comfort layer in this case to ensure adequate pressure relief throughout the night. Side sleepers generally prefer foam mattresses due to the pressure relief aspect and body contouring capability of foam. However, coil mattresses like WinkBeds, with generous layers of foam, have all but erased that distinction. A sleep trial or in-store inspection is advised for side sleepers to test for comfort. Traditionally, the innerspring mattress has been best for stomach sleepers, and this may still be the case in many instances. The support and weight transfer provide a major benefit for stomach sleepers and create the sensation of sleeping on top of the mattress rather than in it. Again, a sleep trial will be helpful for couples, especially if night-time disturbance is an issue for one or both of you. Check our reviews to determine how individual brands rate in this area, but know that if motion isolation is one of your top priorities in a mattress, an innerspring mattress may not be the best option for you. Hot sleepers are generally well-satisfied with innerspring mattresses. The extra support and quick recovery time of an innerspring mattress will keep you from being engulfed by the bed. Also, airflow is maximized with this mattress type, so body heat won’t become trapped as it does with all-foam models. By combining customer review data with mattress specifications and construction details, we’ve narrowed down our top three picks in this category. Each one of the brands below rate highly across the board with verified customers. The engineering combined with quality of materials found in the following mattresses add up to an overall high-quality product at a fair value. Some of the design features you’ll find with these brands have overcome traditional weaknesses in innerspring construction. Others capitalize on the strength and support of traditional innerspring while providing innovative new combinations of materials. Saatva, launched in 2011, features a coil-on-coil (double layer of coils) construction priced at around $1000. 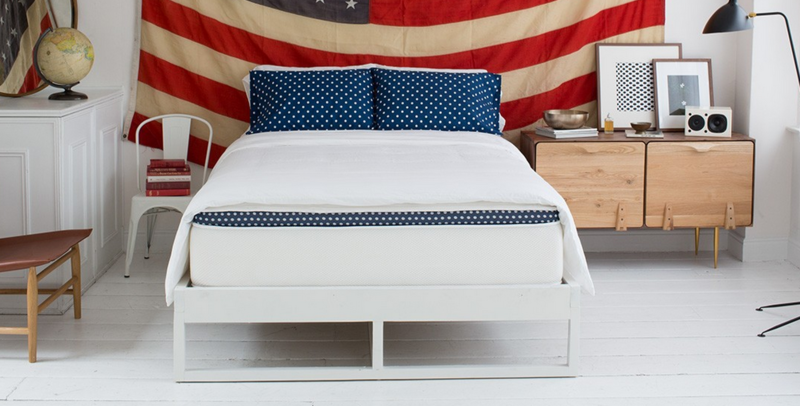 The company uses eco-friendly and natural materials and manufactures its mattresses in the US. The mattress is available in 6 sizes, 3 firmness options, and 2 height options (11.5” and 14.5”). Foam layers: The foam layers are made up of an organic, breathable cotton material that covers a pillow top, followed by a thin layer of memory foam to help provide additional lumbar support. Innerspring layer: The innerspring layer consists of 884 contour coils (Queen) that are individually wrapped in foam to contour to body shape and minimize motion transfer. Support layer: 416 traditional hourglass-shaped coils (Queen) form a supportive foundational base. Lumbar support: The renovated cover of the mattress features a more tightly stitched design in the midsection for additional lumbar support. No offgassing odor: The organic materials and the traditional coil design mean there is no odor and off-gassing period. 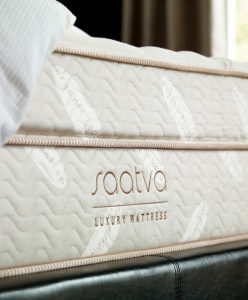 Warranty: The Saatva mattress comes with a 15-year warranty. Check out our full review of Saatva’s coil-on-coil model for more information. The WinkBeds mattress, launched in 2016, features a pocketed coil construction (2 layers) combined with additional support and foam layers priced at around $1300. The company offers an optional remote-controlled temperature adjusting base for an additional cost. The mattress is manufactured in the US. The WinkBed is available in 7 sizes, 4 firmness options, and measures 15” in height. Foam layers: The two top layers of memory foam consist of 1” of lightweight “hypersoft” foam and 1” of gel-infused foam. These layers offer contouring and support as well as the cooling benefit of the gel. Spring layers: The spring layers include a 2.4” layer of foam-encased micro-coils and a base layer of larger foam-encased pocket coils. Both coil layers are designed to maximize airflow. Support layers: The support layers include an inner layer of cotton which separates the two coil layers, and a perimeter layer of dense foam designed to resist compression. Temperature control: Using a layer of pocketed micro-springs, a layer of gel foam, and a Tencel fabric cover, this brand has placed a good deal of emphasis on airflow and breathability. The optional coolControl base uses proprietary technology to filter conditioned air through the mattress from below and allows sleepers to customize the temperature on their side of the bed. According to the company, the technology is similar to that of car seats with a heating and cooling feature. Delivery: A WinkBed isn’t shipped in a compressed state, like the typical bed-in-a-box versions of direct-to-consumer mattresses. This brand hand delivers and sets up the mattress and will even take away your old one (The company calls this the “white glove” service, and it costs $159). Check out our full WinkBeds review for more information. You can also read customer reviews and purchase your WinkBeds mattress on Amazon. Aviya, launched in 2015, features a wrapped-coil 800-count construction priced at around $1000. 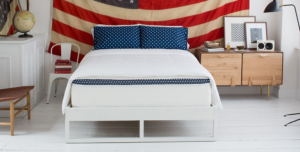 The company uses eco-friendly and locally sourced materials and manufactures its mattresses in Ohio. The mattress is available in 6 sizes, 3 firmness options, and measures 13” in height. Foam top: The Aviya includes 3 layers of high-density foam designed to resist sagging and body indentations while still providing pressure relief. Coil layer: The inner layer consists of highly compact wrapped coils. Cover: The quilted cover includes 1” of comfort foam designed for cooling. Edge support: This mattress includes a 3″-thick foam layer of edging which, combined with the innerspring layer, prevents edge collapse. You’ll find adequate support for edge sitting and sleeping. Durability: Aviya uses high-quality materials, a 15-gauge steel coil construction, and measures at 13”, including the high-density foam top. Although the company is young yet, all signs found in the construction of this mattress point to durability. 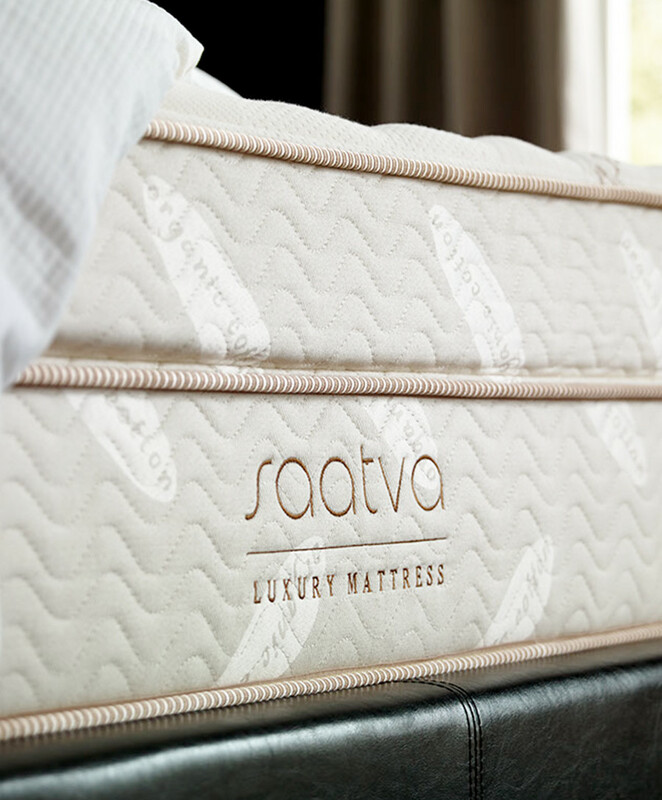 Cooling: The Aviya mattress was designed with advanced air-flow features, including individually wrapped coils and a cooling comfort foam cover. 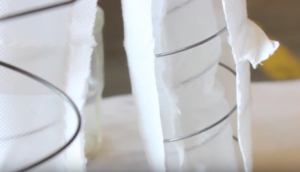 Motion isolation: The high-density quality foam used in the top layer of this mattress has created a surprising degree of motion isolation for an innerspring mattress. The Aviya mattress is available in Firm, Luxury Firm, and Plush on Amazon.